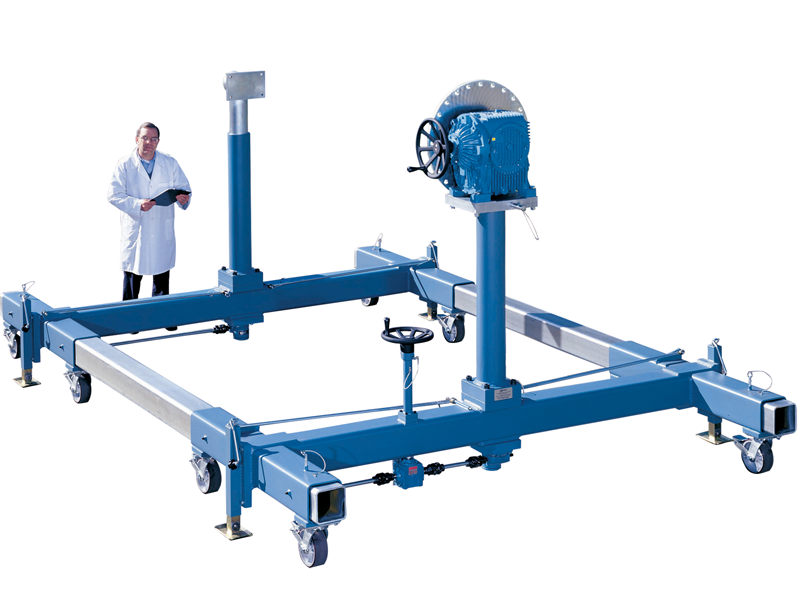 In addition to offering the traditional axis of rotation with a large 100” swing radius, this Spacecraft Positioner has synchronized mechanical lifting capability with a single input hand crank. The risers can be raised and lowered with the payload integrated. The design intent of this tool is to position the spacecraft at an ergonomic height for the technicians during assembly, integration and test operations and then provide vertical lifting capability to raise the spacecraft payload and provide swing clearance for ergonomic rotation. This effectively provides technicians access to all sides of the spacecraft during processing. 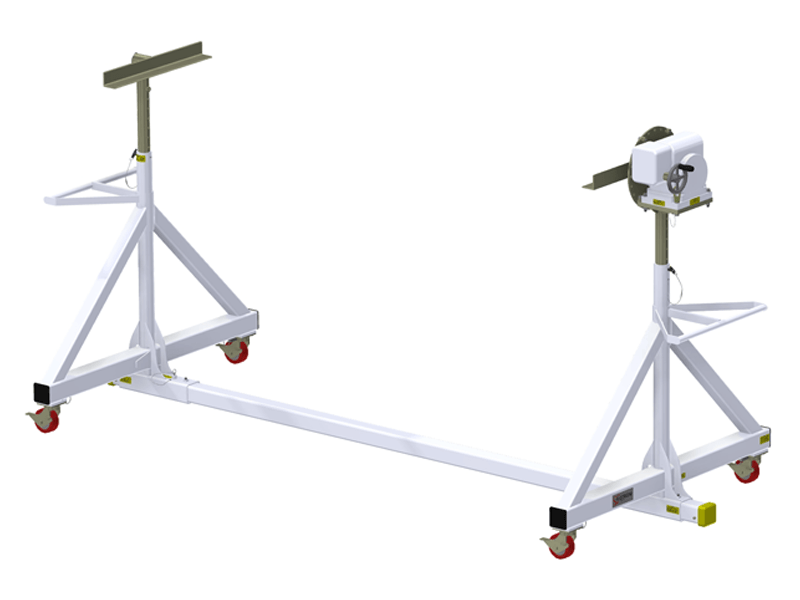 The load capacity of this mechanical ground support equipment is 4,000 lbs considering SFy = 3 and SFu = 5 in addition to a simultaneous dynamic loading condition of 0.5G horizontal (worst case direction) and 1.0G vertical for both stress and stability. 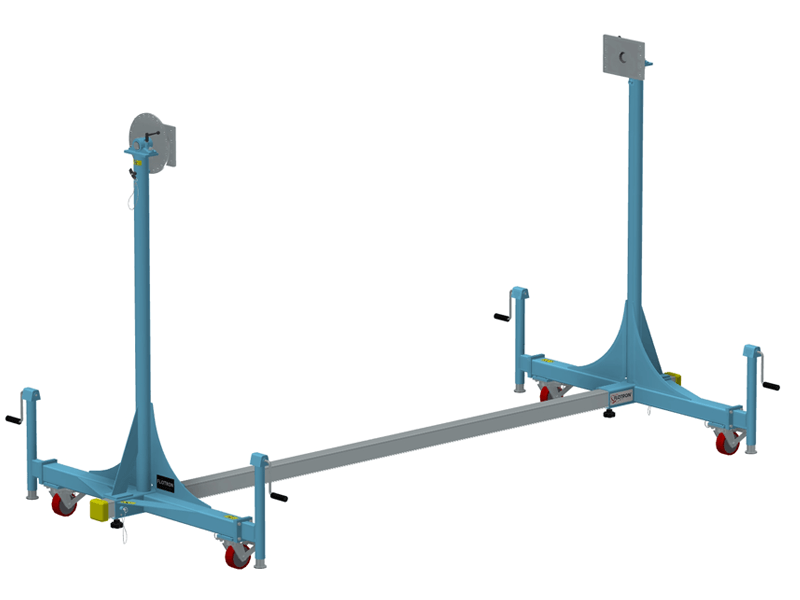 The leveling jacks allow the operator to level the Rotation Fixture on uneven floor terrain. The lock rods are rigidly attached between the frame weldment and the rotation axis index plate to eliminate radial backlash. Heat shield rotation fixture with over 100" of available swing radius and 10,000 lbs. capacity designed to support the Orion heatshield during processing. This tall swing radius Turnover Fixture has a 104” swing radius and a load capacity of 10,000 lbs considering SFy = 3 and SFu = 5 in addition to a simultaneous dynamic loading condition of 0.5G horizontal (worst case direction) and 1.0G vertical for both stress and stability. 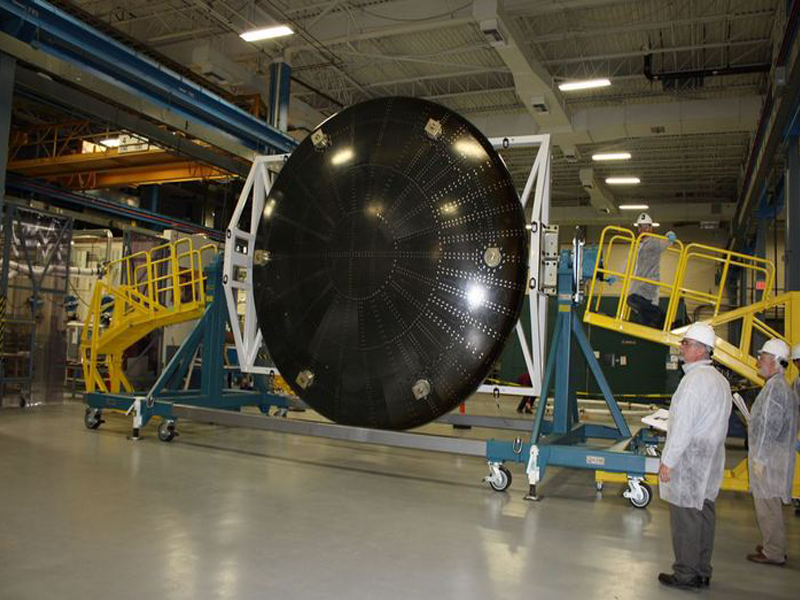 The intended use of this mechanical ground support equipment (MGSE)is to handle the heat shields for NASA's Orion spacecraft during processing. 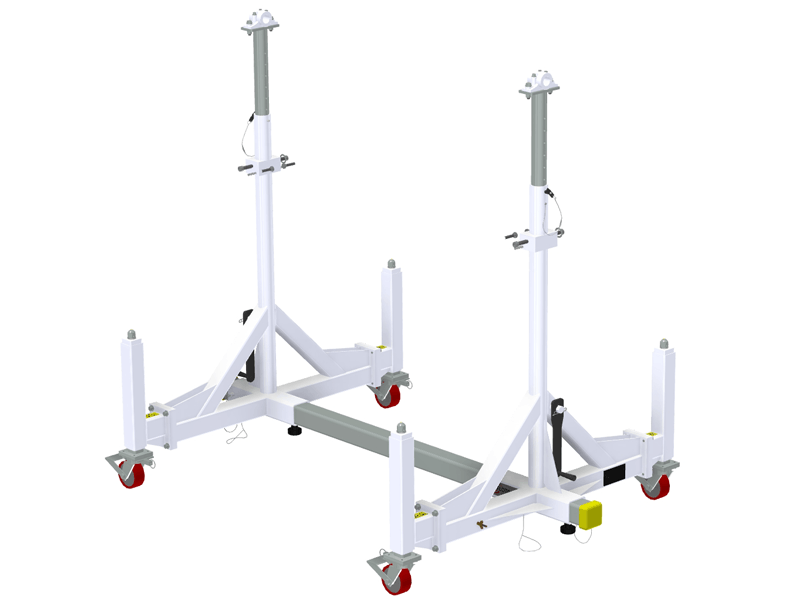 The leveling jacks allow the operator to level the Rotation Fixture on uneven floor terrain. Hard nylon wheel casters improve the ergonomic handling of this large Rollover Fixture when transporting over varying floor terrain. Panel rotation fixture with 67.5" swing radius. Incorporates clean room finish compatible in a spacecraft manufacturing environment capable of supporting tall panels and locking them into position in the vertical orientation. Panel rotation fixture with 62" swing radius. Incorporates a double reduction gearbox to prevent stair stepping, clean room finish compatible in a spacecraft manufacturing environment and push bars to improve ergonomics during transportation. Panel rotation fixture with 69" swing radius. Incorporates pillow block bearings, brake knobs and an indexing plate to lockout rotation. Leveling jacks have been added to level the Flotron on uneven floor terrain.